Share the post "Let’s Get Snail Mailing!" For this month’s Bring Back Paper activity, I’d like to encourage people to send some snail mail out into the world. It’s all about brightening somebody’s day with a little happy mail, a surprise in the post that is sure to make them smile. I like to send out snail mail regularly and have several lovely ladies that I write to. I know how nice it is to receive something through the post that’s not a bill or junk mail and I enjoy putting together letters and packages. A letter, a recipe, a book, a postcard, a selection of stationery/stickers, a colouring book, a note and a tea bag – people often welcome a cuppa, a packet of seeds, a magazine, some chocolate – come on, we’d all be happy to receive chocolate, wouldn’t we?! Anything goes! The idea is to make someone smile when they receive some happy mail, and give you a chance to pen a little handwritten note. So please get your thinking cap on. Who do you know that would appreciate a nice surprise through the post this month? Send one or send a dozen, just get snail mailing! 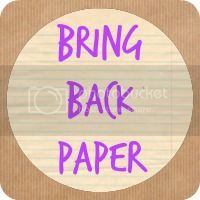 If you do get involved, do feel free to share any photos over on Instagram or Twitter with the #BringBackPaper hash tag as it would be lovely to see them making their way out into the world. If you like the idea of sending snail mail on a regular basis, do check out my Getting Started with Snail Mail guide for inspiration and where to find pen pals. I’m just getting into this and getting totally blinded by accessories. I love your stamps ? Oh the accessories are so much fun! It’s such a shame, we must change that! oooh you have totally inspired me. I’m practically housebound at the moment and keeping in touch with friends on Fb, text or phone when I don’t see them. I have one friend going through a difficult bereavement at the moment and although I’m in touch I’m thinking it would be lovely to send her a little something by post. Oh, that is wonderful to hear! Yes, I think that sounds a lovely gesture, so pleased to have inspired you.